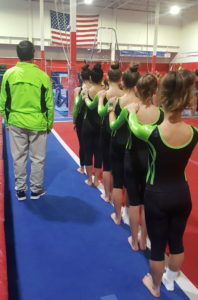 Let your competitive side show while making lasting friendships and excelling at the sport of gymnastics! Team members practice multiple times a week to prepare themselves for competitions throughout the year, leading up to the big state meet! Pre-Team: Children who have shown exemplary skill in classes will first be asked to join our Pre-Team program. Pre-Team practices twice a week, refining skills they learned from class and starting to build the backbone to more advanced gymnastics. Pre-Team does not compete, but within a year each child will be placed onto a competitive team. Excel Team: Bronze, Silver, Gold, Diamond, and Platinum teams are great for gymnasts who are passionate for the sport, but still need time for other activities. These teams practice twice a week to prepare for competitions throughout the year in hopes of qualifying for the state and regional meet. Levels 1-9 Team: Levels 1-5 are compulsory levels that practice 2-3 times a week in preparation for all competitions including the state meet. Levels 6-9 are considered optional levels that have a stricter practice schedule of 4-6 times a week. As the gymnast proceeds through these levels, the skills become more advanced and they have the opportunity to qualify for state, regional, and national competitions. Some students may lose their skills if they do not maintain a consistent schedule. Should you wish to add an extra day of practice, please contact Diane or Tami. We understand that some team members will be late for practice due to school hours and outside commitments. Please notify us if such a situation arises. Please remember team members must pay the $38.00 Registration Fee, applicable once per school year, and fill out a Registration and a Credit Card form. * Please note monthly tuition is due on the 1st of each month and must be paid in full to avoid Team restrictions. *All Team members are required to maintain a valid credit card on file with WGA.